Tantor Media presents a collection of some of the most popular Christmas stories read by two award-winning narrators. This special anthology will transport listeners back to the Christmases of their youth, when they first heard these holiday tales. From Henry Van Dyke's classic Christmas blessing, 'Keeping Christmas,' to Charles Dickens's popular tale of yuletide redemption, 'A Christmas Carol,' More Favorite Stories of Christmas Past has something for everyone. Also included is Louisa May Alcott's inspirational 'A Christmas Dream, and How It Came True,' as well as four other Christmas classics that can be heard and shared year after year. 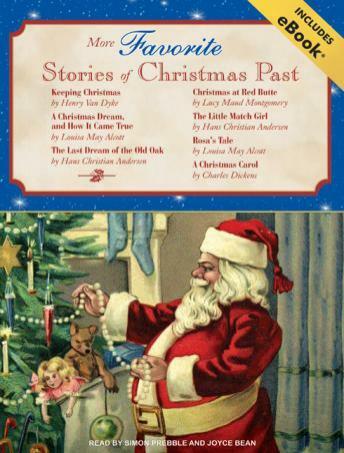 The classics that can be found in More Favorite Stories of Christmas Past are: 'Keeping Christmas' by Henry Van Dyke; 'A Christmas Dream, and How It Came True' by Louisa May Alcott; 'The Last Dream of the Old Oak' by Hans Christian Andersen; 'Christmas at Red Butte' by Lucy Maud Montgomery; 'The Little Match Girl' by Hans Christian Andersen; 'Rosa's Tale' by Louisa May Alcott; and 'A Christmas Carol' by Charles Dickens.